Quickddit is a free and open source Reddit client for mobile phones. Quickddit is not an official client of Reddit and is not affiliated with Reddit in any way. Source available at GitHub, licensed under GNU GPL v3+. Changelog for every release also available at GitHub. More information and discussion at the TMO thread. Hmm.. Double checked the menu and I don't have Hide option. Can someone confirm? The Hide function uses Reddit's API and stores nothing locally, so it's only available if you log in. Hi, Do you have an ETA for the next release? Thank you for this great app! First of all, this application is great, I love it. I am on an xperia phone. I have one issue and one question. - sometimes, like three times till now, when i want to watch a very large gif on your app, the whole phone freezes. Like you cannot do anything with the phone. No restart, no switching app, no closing Quickddit. This happened two days ago like towards the end of the gif. It was a large gif since it took quite a long time to load. I waited for like three minutes hoping it would finish the job and become responsive again but it did not. I had to push arrow-up and power to restart the phone. Do you have any suggestions on this? 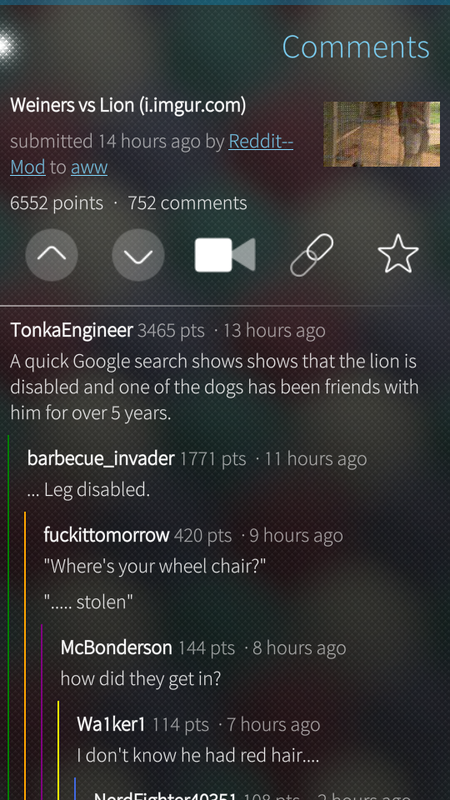 - I never login to reddit, but I would love some functionality to filter out sume sub-reddit threads, something like the functionality of "relay for reddit" in android. It is just that some of these threads are too active and too irrelevant for me. Do you have any plans on this area? Some images causing trouble is a known issue, and unfortunately not fixable by the app, it should be fixed in the Silica/QtQuick components itself. If you have ideas for improvement, please submit then to github as well! Hey, don't know if you're still maintaining this but I can't see images. Anyone else with this problem? I can select "Top" from the "Section" pulley menu, but is there a way to select between "Past hour", "Past 24 hours", "Past week", "Past month", "Past year", "All time" from inside Quickddit? Hey, any chance of making the size of thumbnails scale depending on screen size? They look very small on Nexus 5, but the proportion is great on Jolla. Does it look ok, yes? If you can, can you post another screenshot? Thanks so much for implementing manual scaling of thumbnails, I've been looking into fixing PPI reporting on FP2 but this was a nice surprise! It is getting better and better... Quickddit is a shining star of all Sailfish OS apps! I'm sure you'll like the new 0.9.0 release! I love this app, thank you so much for making it! Thanks for the new version (0.6)! I want to report a small (but annoying) problem introduced in 0.6. It seems that in the comments, your text covers the BackgroundItem, therefore the comment gets highlighted only if you tap and hold outside the text. Is it intentional? Because I liked being able to see an indication that comments are interactive. Hi nodevel. I think it's best if you file this as a bug at github, because this change is the result of a patch a contributor made. If you post it there I'm sure he'll see it. I will probably make a pull request instead, because my eyes hurt looking at a ListItem, then a Flickable and another MouseArea on top of it. A voat client would be great. "will take a look at this. shouldn't be too hard :)"
famous last words :) took me a few days to make it look good. Sign-out / Sign-in fixes the "Bad Request" problem. Thank you very much for this app. 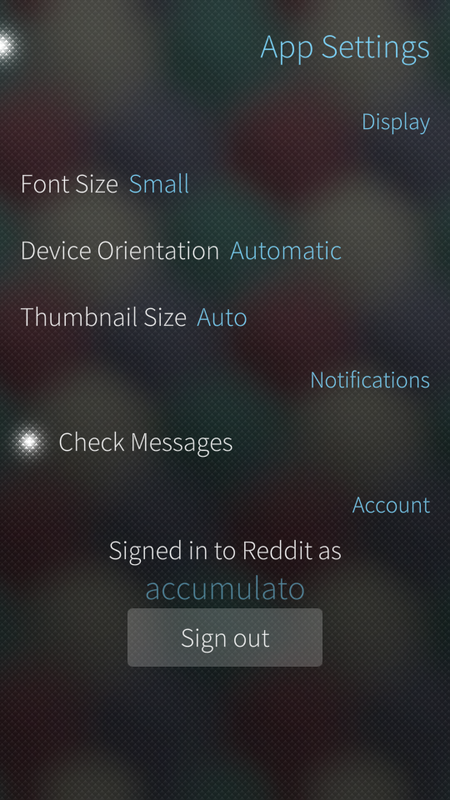 I just couldn't imagine my Jolla without Quickddit!